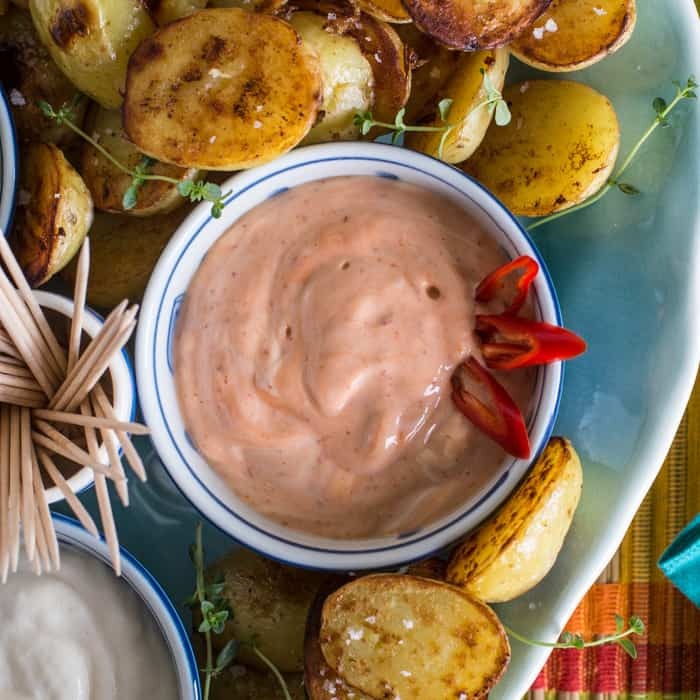 These Saute Potatoes with a Trio of Mayo Dips make the most of new potato season and are the perfect side dish for your next BBQ or campfire feast. Hoorah, finally it’s festival season in our house! We’ve just got back from Rock Oyster festival (more coming on that very soon!) 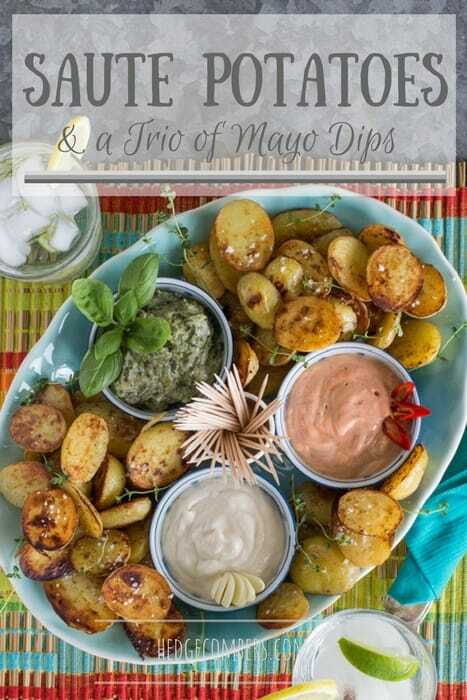 and our previous festy antics have inspired these Saute Potatoes with a Trio of Mayo Dips. A few years back we were at Port Eliot festival and over the course of the weekend we both developed a mild addiction to one particular food stall. They had these gigantic paella pans and were cooking up saute potatoes all weekend long. The crispy fried potatoes were plonked unceremoniously onto paper plates before being topped with a big wobbly dollop of garlic mayonnaise. They were insanely good. The perfect festival food: high in energy and even higher in comfort food points! Since then I’ve made these saute potatoes at breakfast time (they are perfect with a fry up! ), for an easy lunch or, as I’ve done here, for a BBQ side dish. They can be cooked indoors or in a hot skillet over the coals. You can of course saute any potato, but I particularly love new potatoes cooked this way as they crisp up a treat and their waxy flesh gives a lovely buttery bite to the final dish. 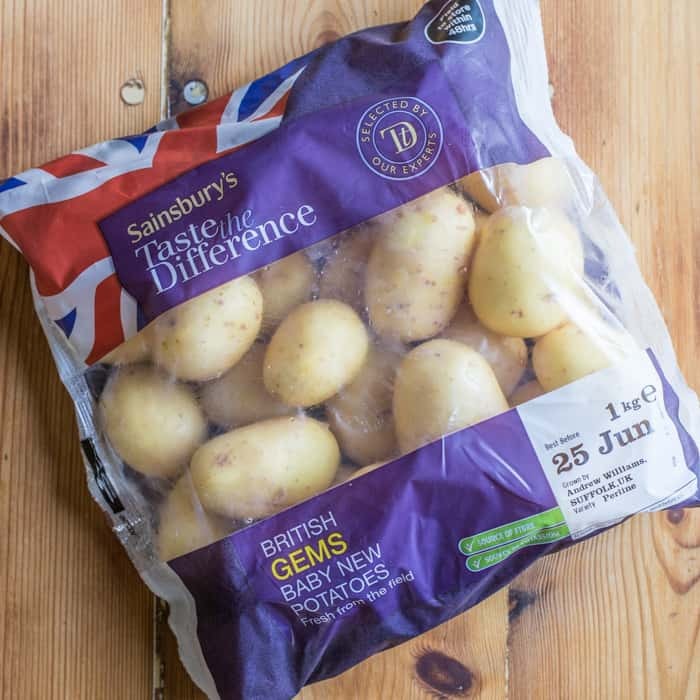 So I guess it was kind of inevitable that when Sainsbury’s asked to create a recipe with their Taste the Difference British Baby Gems Potatoes as the star of the show, that this was where my foodie mind went. These British Gems are in season right now until the end of August and available exclusively at Sainsbury’s. You can find lots more inspiration for this humble little potato by following the hashtags: #BritishGems and #BritGemTasty. Along with the aforementioned garlic mayo, I thought I’d bring some new mayo flavours to the table. 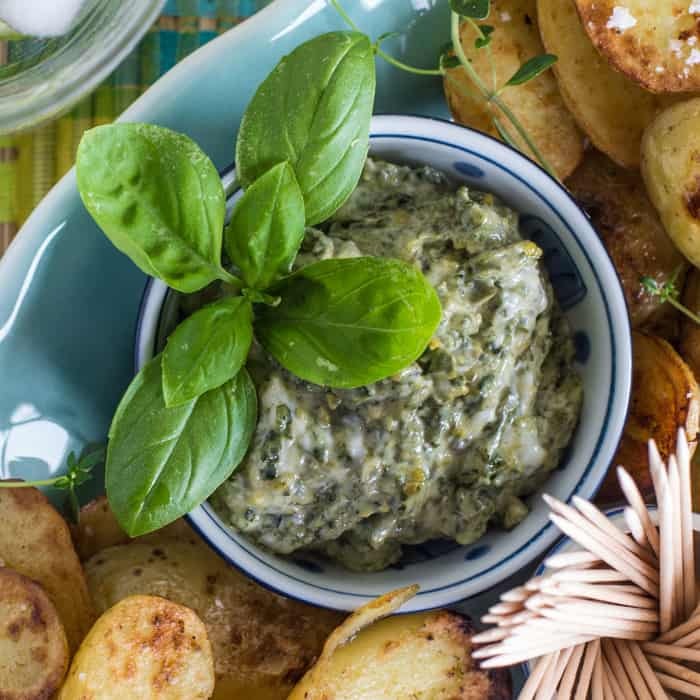 Pesto & mayo make glorious partners, and the harissa version brings a pop of colour and heat to those that like it. 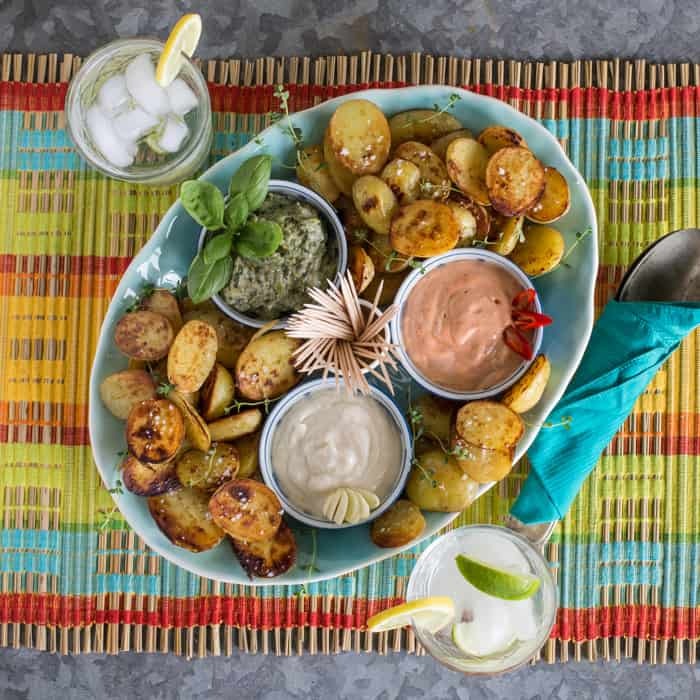 If you need more mayonnaise inspo why not try mixing wholegrain mustard, smoked paprika, lemon juice & zest, mango chutney, or even sriracha to your mayo bowls. Adapt your dips to your favourite flavours. Scrub the potatoes and bring to the boil. Cook for 8 minutes and let drain. Tip the drained potatoes out onto a clean tea towel and gently dry. Any water left on them will spit when it touches the hot fat, and prevent them from crisping. Slice each potato in half length-ways. Heat the oil in a large pan or skillet. When hot, add in the halved potatoes carefully. Let sit for a few minutes until the underneath has turned golden. Flip the potatoes over to cook the other side. Meanwhile mix up your mayonnaise flavours using roughly 2 tablespoons of mayo for each base. Taste as you go, you may find you want more or less flavouring than I've added here. 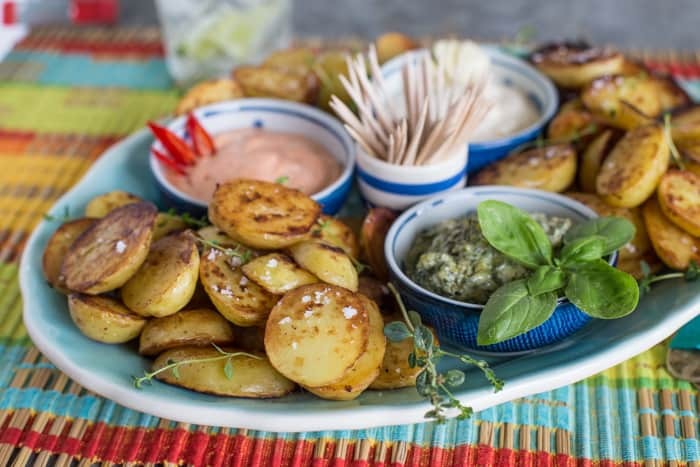 Sprinkle the crispy potatoes with salt and serve with the dips. Huge thanks to Sainsbury’s for sponsoring this recipe and allowing me to continue bringing you tasty recipes, for free! As always all thoughts (and leftovers!) are my own! Haha, consider this your invite Elinor!